There is a lot of mis-information floating around about Beef & Beef Jerky. Frankly a lot of folks like to put a spin on their message to make their product sound better than others. We would never take away from someone else’s story, but we want to offer a little plain talk about beef jerky – whether you buy ours or the other guys’. – The USDA Defines “All-Natural” as “no further processing upon harvest” it doesn’t have a thing to do with the administering of drugs, antibiotics, etc, etc. If you choose to purchase jerky that is advertised as “All-Natural” “no further processing upon harvest” is the only requirement a manufacturer IS REQUIRED to hit. 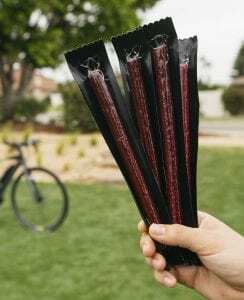 A number of producers, Lucky Beef Jerky being one of them, have made a choice to hold their definition of “All-Natural” to a higher standard. This definition of All-Natural goes well beyond the USDA “no further processing upon harvest” rule to include humane animal handling techniques, No Antibiotics, No Hormones, No Growth Promotants or ANY other medical treatments. “Grass Fed Organic beef is better than traditional Corn Fed beef”. Grass Fed Organic beef is definitely receiving the buzz in the marketplace these days, but the thing to keep in mind is that there isn’t enough grass to support the raising of domestic cattle to support the domestic beef market. This onion needs to be peeled back a couple layers to understand what his means. Just because there isn’t enough grass to produce enough domestic beef for the domestic market demand doesn’t mean folks don’t want to cash in on the demand. What is filling the void is “Organic Grass Fed Beef” from South America and New Zealand… While these more tropical climates do have a much greater abundance of grass and space, how much do you trust the folks raising these cattle without the very watchful eye of the USDA? It is something to consider when looking at beef products that are marketed as organic, grass fed. If someone says they are local, make the vet the information. Corn feeding is still an excellent and efficient way to grow cattle, and it’s been the feed of choice for premier cattle producers for well over a century, it is also why mid-western beef is what is found in the best restaurants in the world. It is a regional delicacy akin to Alaska King Crab, Sockeye Salmon, or Maine Lobster. Corn does a couple things that actually help the environment. Feeding cattle a combination of grass and corn allow the animals to grow at a natural pace that is more rapid than if they were simply browsing on grass. While it may sound calloused, being able to harvest the animal sooner means it will consume less fresh water and other food resources to create a certain amount of nutritious, lean protein. Grass fed beef gain at a rate of around 1 – 1.5 lbs per day. Corn fed cattle gain at a rate of 3.5 – 4 pounds per day. This gets a animal to market weight quicker with less secondary impact on the environment and delivers more beef per pound of feed consumed. Just some facts to keep in mind when making the grass fed/corn fed decision. So how does the beef jerky world work?? Just like any other manufactured product. An enterprising group of individuals go to work on an idea to create a product. They look at raw material, production process, packaging and what it will take sell the product that they create. The way most folks are successful at making money is to create the most value in the product possible. That means pushing the cost on all the raw materials down as far as possible to create the best product that they can for the money invested. In the case of jerky, if a producer of jerky doesn’t own and raise the cattle they produce, then they are at the mercy of the market for consistency of raw material supply and cost. By owning our own cattle, we have 100% control of the raw material going into our jerky. This allows us to make Lucky Beef Jerky a very consistent, high quality jerky. It’s not the cheapest, but once you try it, we believe you will discover that it is among the absolute best “boutique” jerky on the market for a price that is much closer to “everyday” jerky. 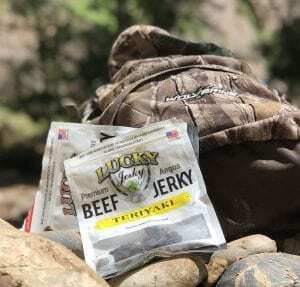 Lucky Beef Jerky is a delicacy that is packed with old world value. Give a bag a try, you won’t be disappointed.